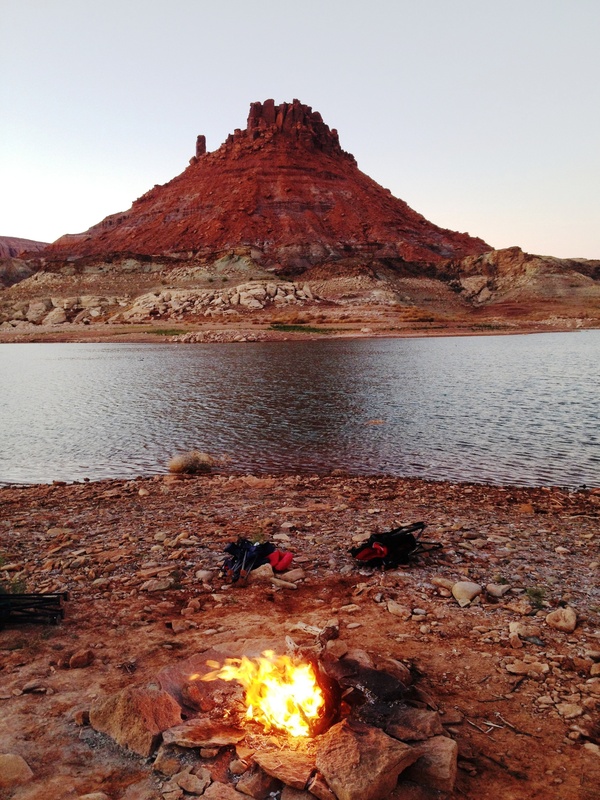 Southern Utah without Lake Powell Pipeline: Dried-up communities or booming like usual? ST. GEORGE — Imagine a future in Southern Utah where water is so scarce, officials have moved past rationing water for homeowners and farmers – and have begun ordering some residents to leave. While a dystopian scenario where Washington County runs out of water may seem unlikely, it’s not an unimaginable one for Ron Thompson, general manager of the Washington County Water Conservancy District. The only conceivable and most cost-effective option to avoid something like a “last in, first out” policy is the Lake Powell Pipeline, Thompson said. The project, currently in its planning stages, would include nearly 140 miles of pipeline under the ground to deliver water from Lake Powell to Washington and Kane counties. Critics say the $1.1 billion-$1.8 billion required to pay for the project is just an example of wasteful government spending and is not the best way to supply water to Southern Utah. Washington County already has enough water sources to last for years, said Zachary Frankel, executive director of Utah Rivers Council. “This Chicken Little fear that we’re growing and running out of water is tired and untrue,” Frankel said. Without the Lake Powell Pipeline, Frankel said Washington County will continue to boom with its existing water sources and expanding with smaller water projects. St. George is the fastest-growing metropolitan area in the nation, according to estimates in March from the U.S. Census Bureau. But while St. George has been growing, water usage in the county has decreased by over 1 billon gallons over five years, according to the most recent numbers from 2015. That amounts to about 143 gallons of water used each day for every person in the county. While the water usage in the county has gone down, there is still a lot more that can be done for water conservation before something as large as a billion-dollar pipeline needs to be built. Keeping the water use at 143 gallons of water per person per day is still too large, Frankel said. Utah’s neighbor to the south uses a lot less water per capita than Washington County. While Arizona has similar climate and water sources to Southern Utah, the water use is at about 100 gallons of water per person per day, according to the Arizona Department of Water Resources. Another Western state has plans to go even further to conserve precious water. The years-long drought in California may be over, but the Golden State’s Legislature still made drastic steps to increase water conservation with a law passed this year that would limit indoor water use to 55 gallons per person per day by 2022 and even further to 50 gallons in 2030. The number of temporary residents in Southern Utah may make water use seem larger in Washington County than other American cities in the desert, Thompson said. A lot of this water use can be attributed to tourists who come to Southern Utah to golf, shop, attend college and have second homes here. As more homes and more businesses are built in Washington County, less and less water will be consumed, Thompson said. As more homes are built in St. George, the amount of agricultural land in the area will decrease. Agricultural land uses significantly more water than residential and industrial land. Apartment buildings, which are starting to be built more often in St. George, use even less water than homes because of the lack of lawn area, he said. 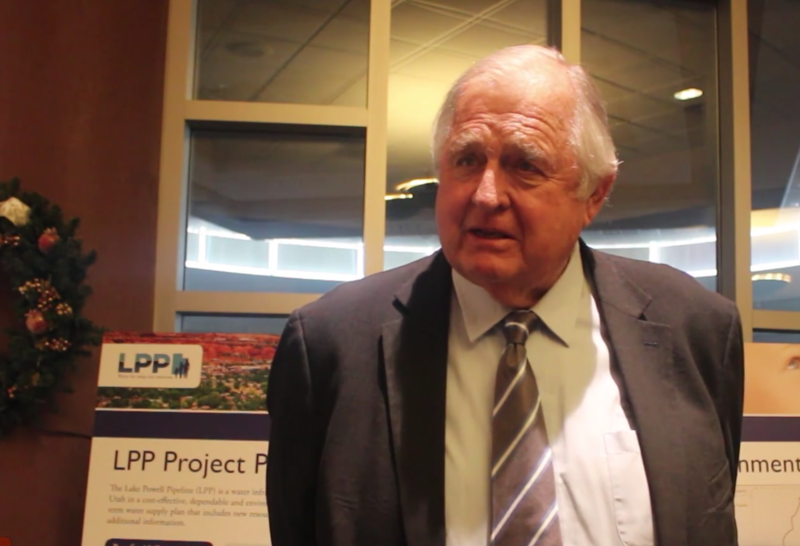 But despite decreased water use, the Lake Powell Pipeline is still necessary to sustain the growth of Southern Utah for 50 years to come, not just for the people living in Southern Utah today, Thompson said. As St. George’s economy continues to grow, so does the need to have backup water sources like the Lake Powell Pipeline. The idea of building pipelines to transport water is not unique to Southern Utah, she said. Thousands of miles of pipelines crisscross many Western states to deliver water, including 4,400 miles of pipelines in the Mni Wiconi Rural Water System in South Dakota, according to a study by the Natural Resources Defense Council. Even the ancient Romans built aqueducts that stretched dozens of miles to deliver water. 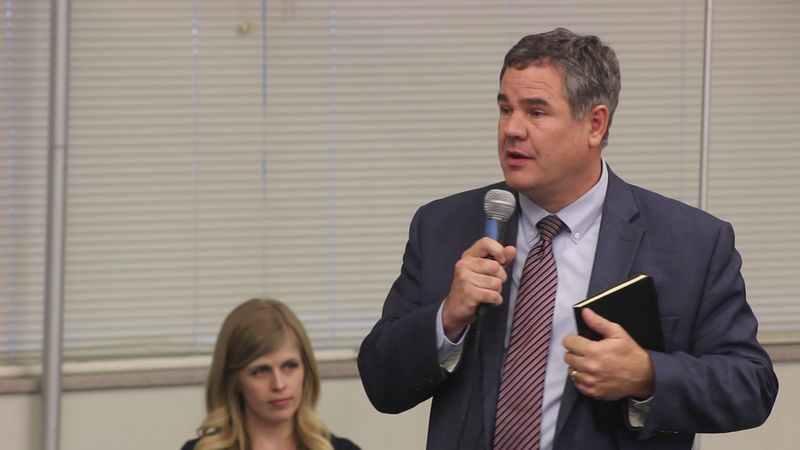 St. George Mayor Jon Pike, who sits on the board of trustees for the Washington County Water Conservancy District, also sees the Lake Powell Pipeline as the best option to provide water to Southern Utah for generations to come because there isn’t any similar alternative. Other options like desalinating the Pah Tempe Hot Springs, which are owned by the district, are far more expensive than the amount of money required to build the Lake Powell Pipeline. “Shy of (desalinating the Pah Tempe Hot Springs), there really isn’t anything that has the kind of volume that the Lake Powell Pipeline could bring,” Pike said. Options like rationing water for outdoor use or placing limits on the amount of growth in St. George to preserve water likely won’t happen soon because “that’s something citizens here don’t seem to want to do,” Pike said. Pike would still be OK with a public vote on the Lake Powell Pipeline because the voters are the ones who will be paying the bill with taxes. While the Washington County Water Conservancy District is big on the pipeline, it is also big on water conservancy as its name should imply, Rathje said. The district has invested nearly $60 million in recent conservation efforts, Rathje said. 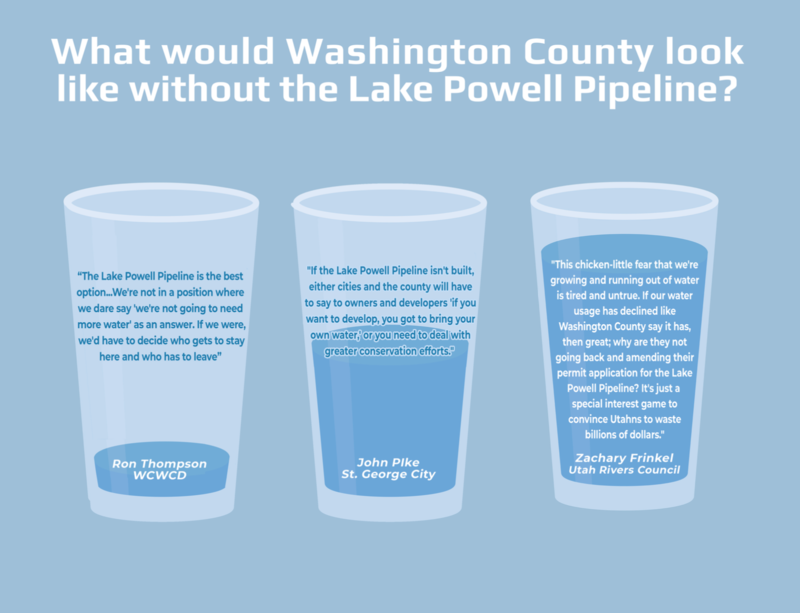 If the Lake Powell Pipeline is ever built, community water leaders like Thompson and Pike may never get to drink a glass of Lake Powell water. Whether they’d even need to if they lived to see 2060 is still up for debate. because there is no guarantee the pipeline will happen at a federal level, especially with record setting drought predictions. should be replaced by someone that is in touch with reality. No question about it, the SW is running low on water. There will be a fight over future water allocations. Arizona currently is wielding a “bigger club” in this issue than Utah. And the attitudes expressed in articles plainly shows that AZ is prepared to swing that “club” hard if their future water demands are not met. Are we prepared to pour billions of dollars into a pipeline system that may not receive enough water by allocation to fill it. A pipeline under this threat of water re-allocation will be useless if only a trickle of water is allocated for S. Utah. Southern Utah currently makes no effort to promote xeroscaping to conserve water. New developments in Washington County all install grass as the norm. Our county is in fact part of the eastern edge of the Mojave Desert—We live in the desert here! Look to Phoenix, Scottsdale, and particularly Paradise Valley where xeroscaping has been promoted for over 40 years. 76% of water use in Utah is for agriculture. The LPP will make a lot of money for the construction sector, but its usefullness to solve this problem has not been adequately proven. Thompson seems to be acting more like a King than a director. Thirty years in the Conservancy Board is way to much. New blood with a broader more civic oriented direction is needed badly. Vote in a new commissioner as soon as possible or be prepared to pay a lot more for water. A Whole Lot More! Thompson has been peddling the same issue for decades now. He is tenacious I give him that. However, what good is a pipeline if you don’t have the water to fill it? The guys pushing this pipe don’t actually care if there’ll be water to fill. They will have already made bank $$$$$$$$$$$$$$$$$$$$$$$$$$$$$$$$$$$$$$$$$$$$$$. The current “drought” (one year after massive rain and snowfall) has word that “fellow” Colorado water users AZ, CA and NV being told to look forward to cutbacks. Oh, you have water rights you say? Fuggedaboudit. The rules will be re-written, even before UT has a chance to drop a line in the river. BTW anyone else remember the story of a Water guy who found a massive aquifer in the Great Basin, but the State wouldn’t pay his fee so he flipped them off? This going back 20+ years. I doubt the pipeline will bear individuals that much financial distress. I’d love to see it so exorbitantly expensive that it effectively halts growth, but that won’t be the case. The larger issue is the culture of large families down here. I’m dismayed to see that the natural growth will outpace our resources in 50 years, pipeline or no pipeline. I am against the pipeline, ergo I am against growth. There, I said it and I feel better now. Wouldn’t a pipeline from Lake Mead near Overton be much shorter than Lake Powell? Good point. An option would be to pipe water from the Colorado up Whitmore Canyon and follow Main Street into town. May have a glitch here, however, since Arizona is one of the high volume users of Mead’s water. But then we would have to change the attitude of the Conservation Czar and that would most likely be impossible. Awesome point. Thing is, you gotta beat em’ to the punch. What’s going to stop a city upstream, say Moab from taking all the water? What about Grand Junction? It’s not going to stop. Unfortunately, under the Colorado River Compact of 1922, Utah (one of the upper basin states) must take its share of the water before it reaches the lower basin states, of which Arizona is one and Nevada another. Our last point to remove water is at Lake Powell. I would like to see a reallocation of water use approvals before we spend one more dime on this pipeline. We need all users to be going to zero scape landscapes not just new development. When I see them remove the backyard recirculating streams from Kayenta and Green Springs, the ponds around town. And most of all the landscaping down the Boulevard (makes it impossible to see traffic when turning left). Then we can talk about this Pipeline (of cash for the good O’ boys). From the article: “As more homes and more businesses are built in Washington County, less and less water will be consumed, Thompson said. As more homes are built in St. George, the amount of agricultural land in the area will decrease. Agricultural land uses significantly more water than residential and industrial land.” This is an interesting comment from Mr. Thompson who is unwilling to include the county’s ag water in the amount of potentially available water for future growth. The state and Thompson only include about 10,000 acre-feet in the future water numbers but about 70% of this county’s water goes to agriculture. Since those are private rights, the state and Thompson won’t include them as a potential M&I water resource. That really skews the numbers given that much of that water will be converted as this county’s population grows over the next 50-60 years. The LPP is not needed now and perhaps never. The water right is not secure given that Colorado River flows are diminishing and the state only gets 23% of what’s left in the Upper Basin after deliveries are made to the Lower Basin. With less and less water in the CR, that 23% will become less and less. Even if the LPP is built and water flows, at some point in the future Thompson’s children, grandchildren and great grandchildren will face the fact that the LPP water will only go so far, too, and will be back in the same predicament as we are now with the same question: How far will conservation take us? Maybe we need to cut California off from the same resources that landlocked states like UT, AZ, CO pull from and let them figure out their own water sources like desalination and perhaps not dumping fresh water they do have into the ocean to save a fish. Isn’t it funny how all these doomsday articles about water shortages come out when their pushing for water rate hikes? Then after all the rate hikes are approved, boom ! ya don’t hear a thing about water shortages for a few years. The problem really isn’t that there is not enough water. The real problem is that greedy developers building too much and the City leaders allowing it. The same severe water overuse that has happened to Tucson, Scottsdale, Phoenix, Palm Springs and the Borrego California areas will certainly happen in Dixie’s near future if the government leaders continue to promote growth at any cost. The proposed pipeline or “The Pipe Dream” might possibly help water shortages in the future but the costs would be astronomical for all of those who will see their water bills skyrocket into absurdity. Growth does not equal quality of life or affordability. All areas have there nature defined growth limits. This is the desert and water is not abundant. Huge growth and expensive pipelines will only worsen the problem. Wake-up time folks! Dixie desperately needs a change in leadership. Make your vote count!